Refresh Shampoo is our signature everyday formula that leaves a long-lasting grapefruit thyme scent. Comfort Shampoo has soothing ingredients that comfort and calm, dry itchy skin. Renew Shampoo helps neutralize naturally occurring pet odors. Enlighten Shampoo naturally whitens, brightens, and conditions light-colored coats. Our popular Ikaria Pet Grooming Shampoos have been reformulated with richer and more luxurious ingredients to pamper pets. 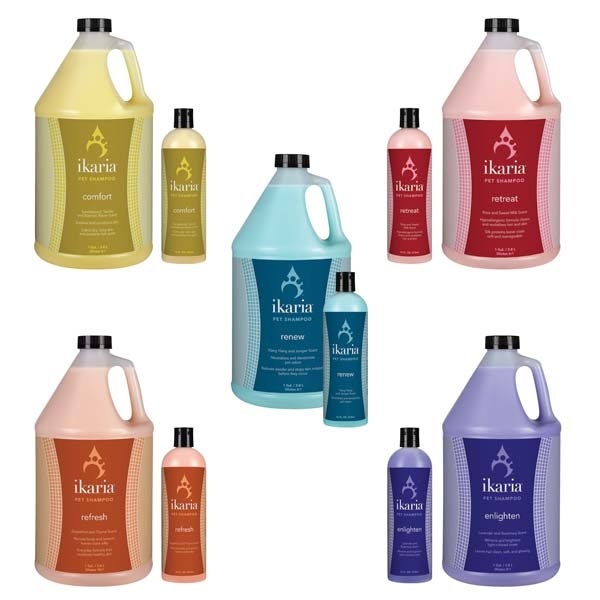 Ikaria Pet Grooming Shampoos dilute up to 8:1 and is safe for puppies and kittens over 8 weeks old.